Who Discovered Elvis Presley Marion Keisker or Sam Phillips? Who Really Discovered Elvis? To dispel any notion who really did discover the talent of Elvis Presley, one has to go back to the beginning and investigate the facts from fiction. Fact: It was July 1953, Elvis then aged 18 and just graduated from Humes High School. It was a Saturday not a weekday thus dispels the idea that Elvis was taking off a couple of minutes from his lunch hour to shell out four dollars to make a record on a mere impulse. Fact: Marion Keisker who had been a well-known radio personality was now working the front desk at Sam Phillips’s Sun Studio. Fact: There was something about Elvis that stuck him apart from all the other hopefuls with guitars – who were waiting to be discovered. Fact : Elvis recorded two of his favourite Ink Spots numbers, MY HAPPINESS and THAT’S WHEN YOU HEARTACHES BEGINS. Fact: Half way through the recording Marion thought, I want to tape this. It was something they usually didn’t do, but she wanted Sam Phillips to hear it. Fact: Call it luck. Call it fate! That on that day Elvis walked into Sun Studio it was Marion Keisker not Sam Phillips at the front desk. But mostly that Marion saw the potential in the teenage Elvis. 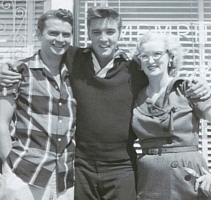 Fact: Elvis recording as usually claimed was as a birthday gift for his mother. There are two reason why this could not be so. First Gladys’ birthday was back in April and the Presley’s did not own a phonograph. Fact: Marion did play the record for Sam although impressed but thought the boy needed a lot of work. So he filed Elvis card into the files and not till January 1954 Elvis went back to Sun Studio and met Sam at the front desk. Sam did remember his conversation about Elvis with Marion, however, gave nothing away to Elvis. Fact: Sam invited Elvis into the recording studio with Sam in the control room Elvis sang two country songs, CASUAL LOVE AFFAIR and I’LL NEVER STAND IN YOU WAY after which he filed the records and forgot. 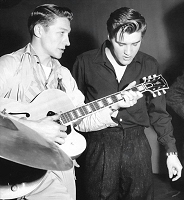 Fact: It was not until May that year that Sam Phillips finally called Elvis … after Marion suggested the kid with the sideburns to record the song WITHOUT YOU after he couldn’t locate the black singer he wanted. Fact: It was Marion who called Elvis at work. As she recalls, “I was still standing there holding the phone when Elvis arrived panting, having run all the way. Fact: Elvis could not master the song WITHOUT YOU. Sam then asked Elvis to do anything he wanted. Elvis sang several Dean Martin songs.